If your living room is relatively small, you may be wondering how to decorate it in a way that is welcoming and doesn’t make the room look smaller. Keeping a few practical small living room ideas in mind while still displaying your creativity will result in a living room that you’ll be happy to spend time with family and friends in. Consider the layout of the living room before you start decorating. If the living room is long and slender, it’s best to keep decorations on the wall instead of on the floor to make for more walking space. For living rooms that are more of an L-shape, a small decorative item in the corner can make the space more interesting without compromising seating space. It’s also best to clean out all the clutter in the living room if you’re redecorating. This will let you know exactly how much space you have to work with, and can provide you with the inspiration you need to incorporate new and visually appealing furniture pieces into the area. Big, bulky pieces of furniture aren’t a good idea for a living room with limited space. 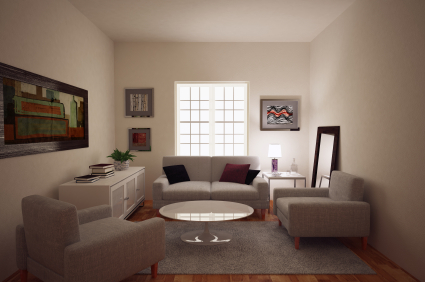 Instead, choose sofas with small frames that will fit easily into the space. A black, brown or gray sofa is easy to decorate with throw pillows in bright colors, which adds another decorative element to the living room without taking up space. One or two additional pieces of furniture, like a small coffee table or an armchair, are sufficient for a small living room. You can decorate the coffee table with candles or your favorite hardback books, or choose a chair in a neutral shade that pairs well with the sofa. Add a throw pillow to the chair to add an extra pop of color. When your living room isn’t especially large, it’s best to showcase the colors you want on an accent wall instead of painting the entire living room a bright color. Red–This shade excites the senses and has an air of sensuality. It’s especially striking in a room with black furniture. Green–Green gives the impression of growth and stability. Medium and bright shades of green like kelly and lime immediately wake up a living room where the furniture is gray or a darker shade of beige. Blue–If you want your living room to give an air of peace and tranquility, blue is the color for the accent wall. A light shade of blue, like periwinkle or robin’s egg, on all the walls, makes the room feel calmer while still making it interesting. Purple–Rich shades of purple give an air of royalty and opulence. This is ideal for the accent wall if a number of your furniture accents are copper or silver in color, as it makes the room look especially elegant. Orange–Orange is a warm color that isn’t as overwhelming as red, but will still make the room look bright and inviting. A burnt orange color on the walls is perfect if your small living room ideas include Southwestern-style decorating, since you can add wall decor like brass antlers or horseshoes to the room, or a throw blanket for the sofa in a Native American design. Yellow–To keep the color from being too bright, choose a butter or golden hue that will pair well with the gray or silver furniture you’ve selected for your living room. A medium shade of yellow in stripes on a stark white wall adds more visual appeal to the space, and a yellow area rug will complement a hardwood floor nicely. Patterns like wide stripes on the accent wall in the color(s) that you choose can also make the room more expansive. A large checkerboard design is a daring design idea that can give the illusion of a large living room as well. Add a few more one-of-a-kind accents to the small living room ideas you’ve added will completely customize the area without taking up unnecessary space. For instance, a beautiful piece of art on the walls can express your creativity while keeping the walkways in the living room open. An area rug underneath the coffee table or sofa in a catchy pattern also lends texture to the room without making it feel cramped.